This one is also being proposed in AeroScale. June 2017 is the 50th anniversary of the Six Day War which I think certainly calls for a campaign. But it brings up a small issue I've been thinking about and I thought I'd ask you all what you think. Should an anniversary campaign such as this start at such a time that the end of the campaign corresponds to the actual anniversary date (in which case it should start around January 1st, assuming the normal six month time frame) or should the campaign start at the time of the anniversary (June 1, 2017)? Or yet again should the anniversary be in the middle of the campaign? Anyway, I certainly would like to see a joint AeroScale - Armorama Six Day War 50th Anniversary campaign. And, of course, anyone else who wants to do figures, ships, etc. as well. Anyone out there agree? And when do you think it should start? Kind of surprised this one hasn't gotten more traction (so to speak). Anyone else interested? We seem to have seven between the two sites so far and the general consensus seems to be a later rather than an earlier start. I figure a March kick-off date would put the actual anniversary in the middle of the campaign. How does that sound to everyone? Welcome John! Campaigns can be a lot of fun, camaraderie and learning rolled into a great modeling experience. Looking forward to seeing what you build. Campaigns will change the way (reasons) you build kits for the better! I'd be up for this campaign. I fancy building a Syrian T34 85 on the Golan heights. March is good for me. March is fine to me, not late enough where I'd forget and build my intended entry, and late enough to get everything im working on finished. It will run from 1 March - 1 September, 2017. If you want to see the rules and sign up, go here. I will be running the campaign out of AeroScale simply because I have a little more pull with the admin ( ) but is open to anyone who wants to enter from any KitMaker site. 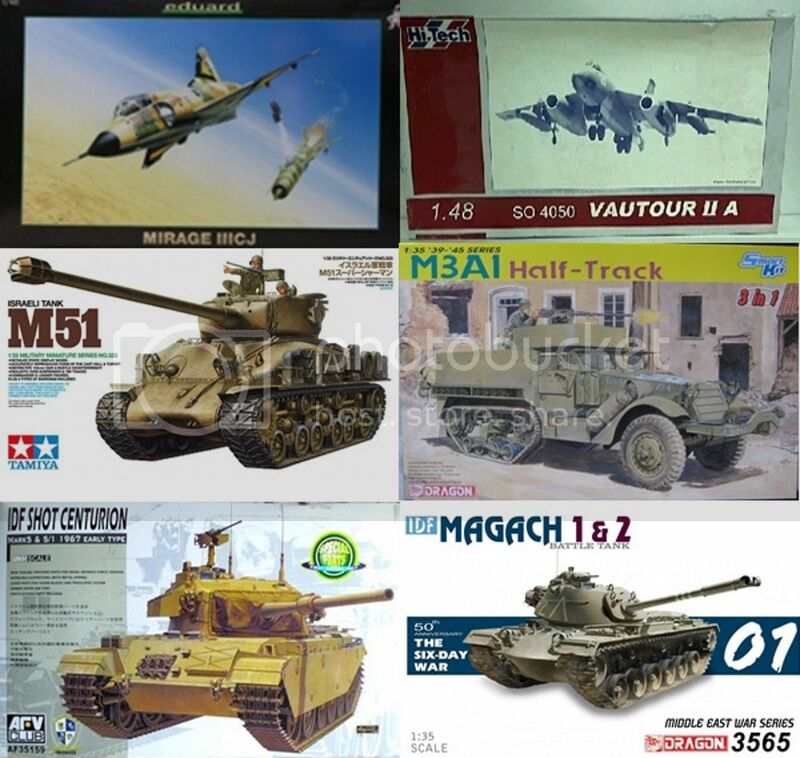 Has Takom's AMX-13/75 IDF Light Tank that would fit in. Yep, I just got my FineScale Modeler magazine in the mail, and Dragon has some offerings specifically tailored to this campaign! Decisions, decisions! Nice Clayton! Which kit? BTW, I don't think the Israelis ever called it an Isherman, that got made up by someone else along the way and is still used occasionally by model companies. I think you're mixing it up with the 1956 Suez crisis. Well, Israel used French jets and British tanks in '67. Is that what you meant Ken? Nice! That's a great kit, and the right configuration for '67 too!